With one in four people ill with Tuberculosis globally residing in the country, India has the highest TB burden in the world of a disease which is preventable and curable. In his last year of college in 2013, Vaibhav Kadam was diagnosed with Tuberculosis (TB), an infectious disease caused by the bacteria called Mycobacterium Tuberculosis. Since then, it has been a fight for life for him. What was diagnosed as a dot-like point in one of his lungs slowly started to spread to both his lungs in patches despite religiously following the course of treatment. “I didn’t think it would turn out to be TB. I was getting pneumonia frequently, around 2-3 times which was not getting cured. That is when the doctor asked me to get a Chest X-Ray done. When the reports came, there was a small dot-like spot. Initially, no doctor could pinpoint it as a source of TB,” Kadam, who lost his father to TB, shared with Delhi Post. As TB was confirmed after a set of tests including sputum tests, he took the normal course of TB treatment in public sector. For four months, the dot-like spot started to lighten. But after the completion of the treatment, when tests were done, it was deduced that more than half of the medicines were not effective on him, which meant that he had Drug-Resistant type of TB (DRTB) which is more difficult to treat with cocktail of 4-5 drugs with many side-effects, taken daily for 20 to 24 months. “Then the tiny spots in my lungs started increasing in size and I was now diagnosed with MDR (Multi-Drug Resistant) form of TB. I had to be given injections, daily for 7 to 8 months. I completed the entire course of treatment, took the injections and the medicine courses on a time-to-time basis. But my condition started to deteriorate during 2014-15,” recollected the 25-year-old. As per the World Health Organisation (WHO), ‘annual TB deaths have fallen substantially since 2000, from 2.3 to 1.6 million. But there are still 10 million new TB cases each year, and despite the availability of effective curative treatments, TB is the leading killer from a single infectious agent worldwide’. Reportedly, India shares one-fourth of global TB burden, and WHO’s Global TB Report, 2018 estimates 65,000 MDR/RR-TB (rifampicin-resistant) cases among notified pulmonary TB cases in India, among which only 26,966 were initiated on treatment. Taking these numbers into consideration, Indian Prime Minister Narendra Modi in 2018 launched the TB-free India Campaign to eradicate the disease by 2025, five years before the global target. Notably, he called for “multi-sectoral engagement and participation of all stakeholders at every level to create TB-free village, panchayat, district and state”. 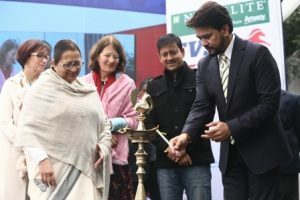 Taking a cue, the TB-Free India Summit was hosted recently by The International Union Against Tuberculosis And Lung Disease (The Union), Global Fund and Member of Parliament and Global TB Champion Anurag Thakur, in which some 65 Indian politicians and celebrities participated in a cricket tournament ‘India vs TB’ at the Major Dhyan Chand National Stadium in Delhi. “TB Harega, Desh Jeetega (TB fails, Country Succeeds) is the motto that binds parliamentarians across party lines. This is a very big message that says that when everyone gets together, change can take place,” said Thakur while reiterating that in the 2018 Union Budget, Rs. 600 crore was allocated for nutritional support to TB patients in India. “I congratulate Modiji for keeping the target ahead of the rest of world and also, keeping nutritional support for TB patients in the Union Budget of 2018 where TB patients get Rs. 500 each month for their nutrition requirements. States also have kept their own targets to become TB-free. I have full faith that as every state progresses (in the direction), our TB-Free India dream would become a reality soon,” he further said. Union Minister of Health and Family Welfare J.P. Nadda, who inaugurated the two-day event announced “firm commitment” to the 2025 target. TB survivor Kadam was only to be given 15 days to live when his treatment failed, if it wasn’t for WHO recommended new drugs – Bedaquiline and Delamanid (provided by international humanitarian and medical aid organisation Médecins Sans Frontières). “I wasn’t ready to take the treatment initially because of the constant medicines and injections which had terrible side-effects. A person loses his motivation when such things happen and treatment is for longer duration. Finally, I started the treatment thinking that either way, death is imminent. For the first three-four months, the sputum results were positive (indicating TB) but then the sputum results were finally negative (and cured),” said Kadam, who took additional treatment for neuropathy in his legs and hands. Now, totally cured, Kadam looks forward to becoming employable in the next 3-4 months. According to WHO, ‘treatment of drug-resistant-TB (DR-TB) – particularly MDR/RR or extensively drug-resistant (XDR) forms – presents a number of challenges to clinicians and national TB programmes. In 2017, 10 million people fell ill with TB and 1.6 million died from the disease. MDR-TB and XDR-TB both take substantially longer to treat than ordinary (drug-susceptible) TB, and require the use of second-line anti-TB drugs, which are more expensive and have more side-effects than the first-line drugs used for drug-susceptible TB. The guidelines in a rapid communication recommend Bedaquiline and other new oral drugs for DR-TB patients, while minimising the use of drugs with severe side effects. Additionally, ‘kanamycin’ and ‘capreomycin’, two injectable drugs associated with side effects which have increased the risk of treatment failure have are not been recommended. The Global Fund recently announced that it is aiming for donors to pledge at least US$14 billion in funding at its replenishment meeting to be held in Lyon, France, in October this year which it said will help save 16 million lives from the combined diseases of AIDS, TB and malaria. Ahead of the Lyon replenishment, the Global Fund will hold a preparatory meeting in New Delhi on February 7 and 8 hosted by the Government of India. While the teams playing the friendly-match reposed faith in the batsmen, the 2025 target of TB-Free India has reposed faith in all its stakeholders.